Serving guests since 1919, the C Lazy U Ranch has become known as Colorado’s premier guest ranch for providing the highest level of personalized service, professional horsemanship programs, first-class amenities, an enriching children’s program, expertly prepared meals and upscale Western-style accommodations. C Lazy U Ranch is an award winning ranch that has been recognized by Condé Nast Traveler, USA Today, Wine Spectator, TripAdvisor and many others . The Ranch’s “Lazy You” Spa has been named one of Colorado’s top 25 Spas. You will also find C Lazy U in the New York Times Best Seller “1,000 Places to See Before You Die.” For over a century, the C Lazy U has prided itself on providing the ultimate western family experience. From deluxe rooms to private cabins, guests can choose from a variety of lodging options to suit each individual, couple, family or group’s needs. The Ranch's luxury accommodations have all been recently renovated and include multi-room suites, twin-bedded rooms for children, deluxe suites and even a secluded honeymoon cabin. Almost all cabins have wood burning fireplaces, plush beds and bedding, robes, snacks, refrigerators and Keurig machines for coffee and tea. 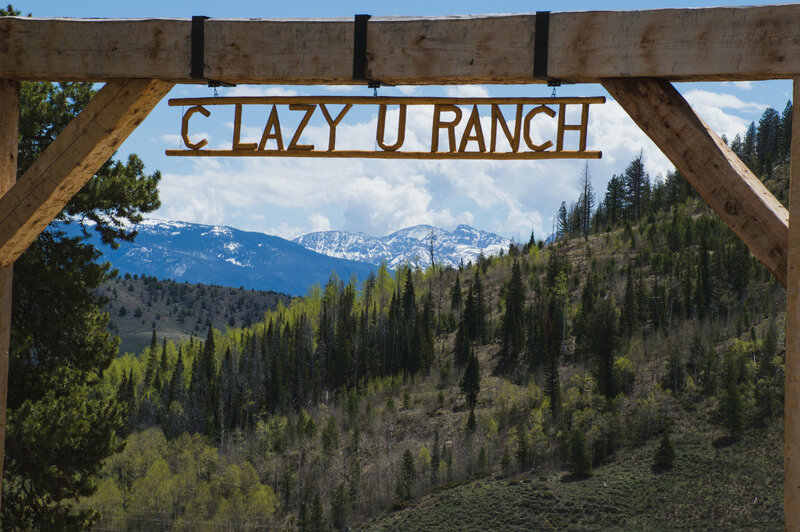 C Lazy U Ranch offers a wide variety of activities across 8,500 acres of breathtaking Rocky Mountain scenery. At the heart of it all is the horseback riding program, which offers instruction for riders of all experience levels. The ranch has an extensive trail system and offers slow and scenic rides for beginners to fast rides where guests can canter and lope and everything in between. Guests are also welcome to ride in the 12,000 square foot heated indoor arena. No matter where you chose to ride, you’ll be doing it on a horse that's individually suited for your riding ability for the week. Other on-site activities include Orvis endorsed guided fly fishing on the ranch’s casting pond and two miles of private stream. Tennis, hatchet throwing, archery, an outdoor pool and hot tub, guided hikes and guided mountain biking round out the included activities. Guests have the option to sign up for the ropes course, zip line, trap shooting, and award winning spa services at an additional cost. Winter activities include cross country skiing, snowshoeing, sledding luge, private tubing hill ice skating and hockey. Optional sign up for trap shooting, snowmobiling and spa. For adventurous guests, the C Lazy U provides shuttles for off-site river rafting, golfing at 4 nearby championship courses, hot air ballooning and skiing at local ski resorts. C Lazy U Ranch is known for its legendary gourmet dining and extensive wine pairings prepared by its executive chef and sommelier. Meals range from four-course fine dining in our main lodge, to more informal cookouts at the Patio House. The ranch even throws in some exciting cocktail and cookout events in remote scenic overlook locations. Adults are served hors d'oeuvres in the lodge lounge each evening during cocktail hour, and they can enjoy the convenience of a fully stocked bar in the ranch saloon, before enjoying a 4 course dinner consisting of regional specialties. Each day the ranch prepares an array of dining options to satisfy the most discerning and heartiest appetites while accommodating individual dietary restrictions and requests. Children typically eat with their counselors for lunch and dinner and are served more kid friendly selections while ensuring the proper nourishment with healthier options. Service charge of 20% is added to your final bill. Cash, personal check, Visa, MasterCard and American Express. Whether planning a meeting, teambuilding event, conference or corporate retreat, C Lazy U Ranch is the perfect place for small groups to escape into the mountains and leave the city life behind. Large groups have the option to buy out the ranch exclusively for an intimate teambuilding event. The Ranch offers a non-structured, flexible environment for business gatherings with the ability to fully customize meetings to the company or group's specific goals and objectives. All summer & winter activites including team building. Choosing to have your wedding at C Lazy U allows for an intimate and private experience at one of the most spectacular places in the world. The natural setting of the guest ranch is far from the distractions of most resort environments and allows for a serene an inspirational environment perfect for creating memories that will last a lifetime. The ranch only allows exclusive buyout weddings to ensure the success of your wedding. We can help you plan the perfect wedding, complete with all the facilities, banquet services and even a secluded Honeymoon cabin. Your wedding will always be remembered and cherished when you have it in this unique and lovely setting. Please contact us for more details and specific dates. Contact us to obtain information regarding family reunions.